This attractive home covered entry leads into the Great room and into the kitchen. Pocket doors offer privacy to the kitchen and nook area. An work island, built-in pantry, and eating bar add to the efficiency of this area. The formal dining room has a built-in china cabinet area. The Great room enjoys an abundance of natural light provided by three large windows. A gas fireplace with built-in shelving to either side further enhances the great room. The master suite includes a French door to the rear patio and a plush five piece bath. The secondary bedroom could easily become a secluded den. Cover Sheet Landscaped architectural rendering of the exterior help the owner/builder visualize the new home completed. 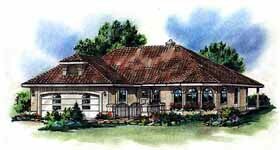 Foundation Plan 1/4 inch scale basement and foundation plans with all necessary dimensions and notations. Floor Plans Detailed 1/4 inch scale main and upper story plans with complete dimensions. Floor plans also include room sizes, detail cross section keys and location of plumbing fixtures. Electrical Plans 3/16 inch scale electrical plans showing light fixtures, switches and plug locations. Cross Sections 1/4 inch scaled sections of the foundation, interior and exterior walls, floor and roof details for design and construction methods. Site Plan A stock plot plan with a detailed aerial view of the home situated on a rectangular lot is provided. Exterior Elevations 1/4 inch scale exterior elevation drawings of the front, rear and both sides of the house. These drawings show window and door locations as well as general material specifications. All plans are drawn with 2x6 exterior walls. Lumber, windows, doors, nails, insulation and trims. No HVAC or electrical included.